Cornerstone Homes believes that the community surrounding your home is as important as your new home itself. So why do our communities stand out? Because our mantra, "It's all about lifestyle," extends to our amenities, which seek to foster a sense of community, health and wellness, fitness, and F.U.N! The days and nights around your community pool with your friends and neighbors are fun filled... and with good reason. We want to make sure you have fun and get to know your neighbors starting on day ONE. During summer days, there’s nothing sweeter than stepping into a refreshing, clear blue pool to cool off, enjoy the sunshine, and relax. 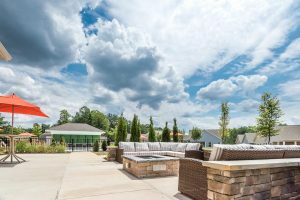 With activity and fun everywhere you look, from social events in the clubhouse to cocktails outside, our pool is going to make your days here even better and cool your summer! 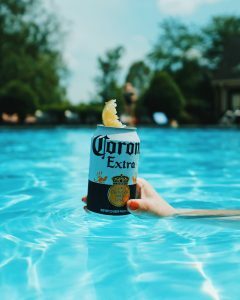 At Cornerstone Homes, we believe that this chapter of your life is one giant vacation… So, have a blast at your very own pool party whenever you want! 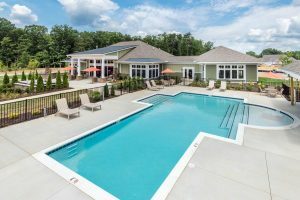 Now you can walk out your front door, stroll down the sidewalk to the Clubhouse and Pool, and make a splash! Grab your wireless speakers and rock out to music with your friends, cheers with your favorite cocktail in hand, and lounge by the edge or float in the water. It’s time for the fun to begin, so jump right in! 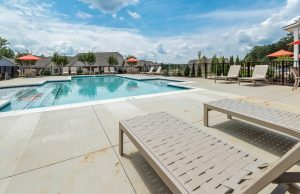 Homeowners in all our Cornerstone communities love hosting events around the pool. From Hawaiian Luau parties and sipping sweet drinks from coconut cups, to casual get-togethers where all you need is some sunscreen and a six-pack, to relaxing days with your favorite book and a lounge chair, homeowners take advantage of any reason to gather at this cool relaxing community space. After a sunny afternoon at the pool, what sounds better for dinner than a juicy burger or grilled dish? 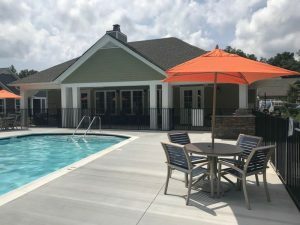 At our Cornerstone Homes communities, you will find the poolside outdoor grill and bar is a popular gathering spot - perfect for cooking up your best BBQ meals. On weekends and weekdays, you will always find homeowners meeting up for cookouts and a chat! They bring their favorite side dish, like creamy coleslaw or potato salad, as the perfect companion for a grilled hamburger or hotdog. 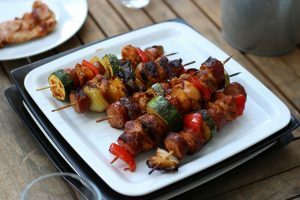 The best part - the fresh vegetables from the Corner Patch Gardens that taste great on the grill. Charred zucchini, roasted corn on the cob, roasted onions, or peppers with sausage are sure to please any crowd. Getting your blood pumping in an aerobics class not only improves heart health, lowers blood pressure, and boosts brain function, it also puts you in a good mood and helps you get a better night’s sleep. Aerobics classes are a fun way to hang out with your friends, meet new neighbors, and feel great about yourself. After a nice workout, you’re already in the pool and ready to relax! Swimming laps is an effective way to put your body and mind to the test as you strive for a certain number to complete. Whether by yourself or with a friend, this activity keeps you pushing yourself to the best of your ability — while still having a great time! Swimming laps works your whole body without any of the stress you get from out-of-water workouts, so it’s ideal for those with certain injuries and disabilities. Of course, there’s nothing like a good arm workout. If you’ve always wanted toned muscles, the pool is the place for you! While you’re lounging in the shallow end with all of your friends, try out this incredible, three-step workout: bring your ice cold bottle of beer to your mouth, take a sip, and repeat! We have to say, the “beer exercise” is probably our favorite! There’s no better time than right now to make a splash. So, head on down to the pool and discover more luxury and leisure in your life! We can’t wait to see you there.